It is one of those grey, wet, chill days, where venturing further than just outside the back door is not at all appealing. Nevertheless I managed to find a few items without getting wet so that I could join Cathy at Rambling in the Garden again for a Monday vase. This dear little sugar bowl was the inspiration for today’s vase, along with some cinnamon sticks which still haven’t been put to good use. The crystalized sugar next to the vase is perfect for adding to spiced winter teas too. Some silver fir, hellebores, heuchera leaves, beech twigs and a few violas from the patio were enough to create a small but satisfying arrangement, with little time on hand! This will probably be my last vase of 2015, as I will be away next week. So thank you to Cathy for the inspiration and encouragement, and especially your dedication in hosting this meme. 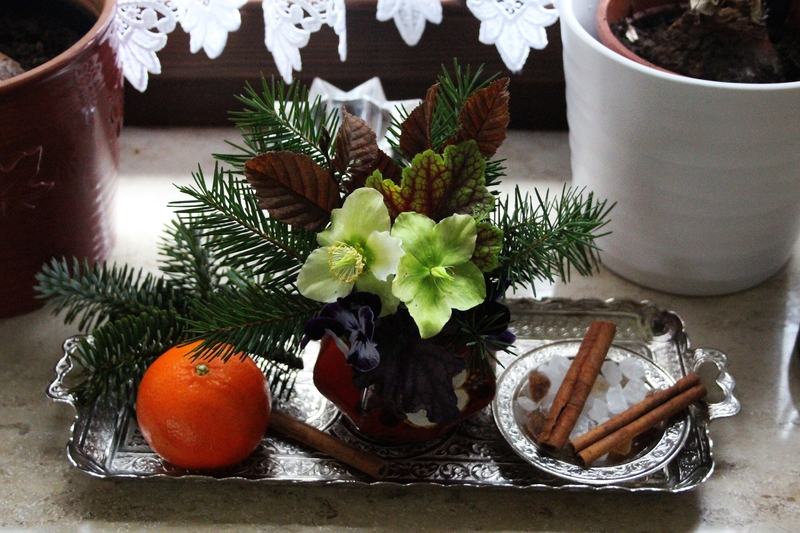 This entry was posted in Herbs & Spices, In a Vase on Monday, Nature and tagged Christmas, Cut Flowers, Spices, Winter. Bookmark the permalink. Wishing you a very Merry Christmas Cathy! And oh what a perfect vase for the holidays…love the materials and the arrangement! Thanks Dawn, and a very happy Christmas! Gorgeous! We have had another rainy night and the yard is soaked, but you have inspired me put on my gardening shoes and get out and gather! Thank you Cathy! Thanks Deb. So glad I could provide a little inspiration! Happy Christmas! 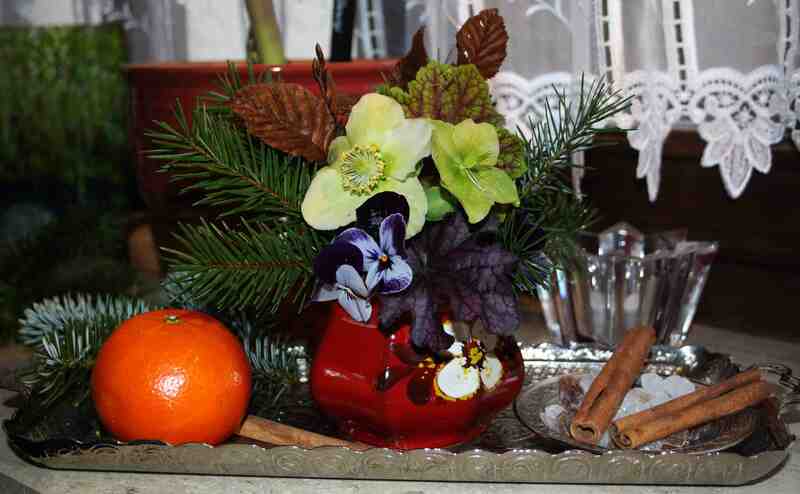 A lovely Christmas arrangement Cathy. Happy Chritsmas to you too, or should I say ‘ Frohe Weihnachten? Suitably rich and festive. Happy Christmas! Enjoy a sugar and spice Christmas Cathy. Thanks Brian – you too! Gorgeous and so colorful. Have a great Christmas. And a very merry Christmas to you Susie. That is lovely, wish I could smell it. Merry Christmas. I wish you a wonderful Christmas Cathy. What a sweet (and spicy) composition – all on a pretty silver tray. The light and dark greens are offset by the contrasting pop of orange – lovely! Merry Christmas! And a very Merry Christmas to you too Anca! It is amazing that you could find so much without venturing much past your back door Cathy – they make such a perfect seasonal scene! Merry Christmas to you – do enjoy your week away. Thank you Julie! Hope you have a magical Christmas! Now I thought that the sugar was hailstones Cathy and was admiring your tenacity. I like the contrast of the hellebores against the heuchera leaves – a most pleasing effect. Thank you Anna, and the hellebores are lasting well, which is not always the case. Hope you have a lovely Christmas Anna. The hellebore blooms look especially good with the backdrop of the heuchera leaves, Cathy! Best wishes for a merry Christmas! Thanks Kris. Wishing you a wonderful Christmas too! Thank you. Seeing these photos made me smile. 🙂 Merry Christmas. A very Merry Christmas to you Cathy! Happy Christmas from damp Devon! You need both sugar and spice for a good holiday. Merry Christmas! I think I have had enough sugar already to last me till Easter! LOL! Happy Christmas! Thank you. Lovely to hear from you whenever Ann, and I hope you had a great Christmas!